The Provincial Council of Sri Lanka’s Tamil-majority Northern Province on Tuesday unanimously passed a resolution which put forth three very radical demands to the UN Human Rights Council (UHRC). But these hyperbolic demands seem to be unrealistic in the context of emerging geo-political realities. The demands are as follows: refer the “war crimes” issue to the International Criminal Court (ICC); impose targeted sanctions against Lankan military personnel; and get the UN to conduct a referendum among North-East Lankan Tamils to determine the political preference of the Tamil speaking people towards finding a permanent political solution. The resolution’s timing and the extent of support it got from the members of the NPC, indicate two things: First, it is timed to reach the ears of the members of the UNHRC which is in its 39th session from September 10 to 28. Second, it is election-time posturing. The NPC’s term is ending soon and fresh elections are on the cards. In the run up to the polls, expected to be held later this year or early 2019, every Tamil political party would like to portray itself as a champion of Tamil rights. The NPC was used as a forum to advertise this and the resolution was used as an instrument to express Tamil sentiments loudly. Given Colombo’s reluctance to meet the humanitarian and political demands of the Tamils (transitional justice and a federal constitution), no Tamil political party could afford to opt out of the resolution and be seen as being pro-government. This lies behind the unanimous support it got. 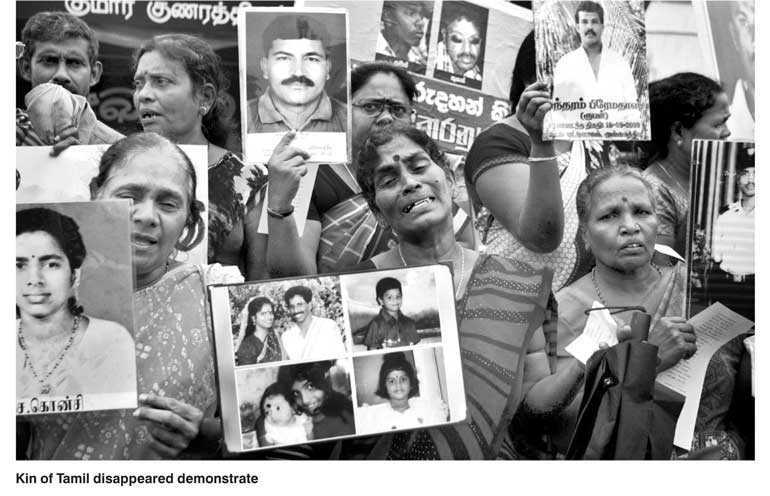 The NPC’s resolution recalled that the March 2011 Report of the UN Secretary General’s Panel of Experts on Accountability in Lanka stated that there were credible allegations that war crimes were committed during the final stages of the armed conflict between the Government of Sri Lanka and the Liberation Tigers of Tamil Eelam (LTTE) which claimed over 40,000 lives. According to the November 2012 Report of the UN Secretary-General’s Internal Review Panel on UN Action in Sri Lanka, over 70,000 people were unaccounted for during the final phase of the war in 2009. The resolution said that Sri Lanka was a co-sponsor and signatory to the Resolution 30/1 at the UNHRC session in September 2015, which, inter-alia, proposed establishment of a Judicial Mechanism with a Special Counsel to investigate allegations of violations and abuses of human rights and international humanitarian law. The UNHRC sought a credible justice process to include independent judicial and prosecutorial institutions led by individuals known for their integrity and impartiality. It stressed the participation, in a Sri Lankan judicial mechanism, including the special counsel’s office, of Commonwealth and other foreign judges, defense lawyers, and authorised prosecutors and investigators. The NPC resolution pointed out that as of March 2017, Sri Lanka had failed to take any significant measures to implement its commitments to Resolution 30/1. In March 2017, Resolution 34/1, which was co-sponsored by Sri Lanka, gave a two-year extension until March 2019 for the government to implement Resolution 30/1. But the Government of Sri Lanka has failed to take any meaningful steps towards implementing the Resolutions 30/1 and 34/1. On the contrary, the Sri Lankan President, the Prime Minister, and senior members of the government have been on record saying that they will not fully implement the UNHRC resolutions. The NPC pointed out that the political conflict between the Sinhalese and the Tamil speaking peoples in Sri Lanka (which includes Muslims who are also Tamil-speaking) has been escalating since independence in 1948, and that the root cause of the war was the political conflict which has so far not been addressed properly despite numerous attempts. The NPC called upon the UNHRC to refer Sri Lanka to the UN General Assembly and to the UN Security Council to be referred to the International Criminal Court or to a specially created international criminal tribunal set up by the UN. The NPC said that the UNHRC should appoint a UN Special Rapporteur for Sri Lanka to monitor the plight of the war affected Tamil speaking people, disappeared persons, political prisoners, continued arbitrary detention under the Prevention of Terrorism Act, presence of large and disproportionate number of Sri Lankan security forces in Tamil areas, and the occupation of private lands by the Sri Lankan security forces in the North-East region. It said that the UNHRC should urge the UN to impose military sanctions on Sri Lanka, until substantial progress is made in this regard. All member countries of the UN should deny entry visas to Lankan military personnel implicated in war crimes, and explore other avenues, including the application of Universal Jurisdiction as proposed by UN High-Commissioner for Human Rights in his Annual Report dated 26 February-23 March. Since Sri Lanka has failed, and is unwilling to offer an equitable political solution to the Tamil speaking people, and has failed to take adequate measures to prevent the recurrence of the past violence, the UN should conduct a referendum in the North-East region of the island to determine the political preference of the Tamil speaking people towards finding a permanent political solution. While many of the member countries of the UNHRC might agree with the charges made in the resolution, they may not recommend the actions sought by it, given the changed political context in Lanka and the changed geo-political situation in South Asia. The present Sirisena-Wickremesinghe Government is markedly pro-West. The charges against Sri Lanka were first made by the West when the island was under Mahinda Rajapaksa’s nationalistic and pro-China government. Though the present Government is also opening its doors to China and is part of the latter’s Belt and Road Initiative (BRI), the West still feels that it is more friendly and pliable than the earlier regime led by Rajapaksa. The West is now more inclined to wean Colombo away from Beijing by dangling a carrot before it than wielding a stick against it. The West is proposing to finance small scale people-oriented grass roots level development projects which President Sirisena will appreciate and the masses will feel grateful for. Such projects are expected to get greater public support as compared to China’s massive and expensive infrastructure projects which bring no immediate benefits to locals. Recently, major Western funding agencies jointly met President Sirisena and pledged support for small and medium sized projects in a wide range of areas. Simultaneously, Japan and the US are cultivating the Lankan Army and Navy, making them participate in seminars and exercises to forge interoperability. Japan, US and India have given naval vessels. The West and India have given Lanka a key place in their anti-China Indian Ocean maritime security architecture. Regional power India is also trying to wean Colombo away from China, and not to alienate it. India always worked through the government of the day. Sensing that the not-so-friendly Rajapaksa is on a comeback trail, it recently invited him to India to meet Prime Minister Narendra Modi. In this emerging context, it is inconceivable that the West and India would actually pillory the Lankan government. On its part, the Government has been implementing schemes to lift the economic life of the war-affected Tamils to meet some of the concerns of the West and India. It has set up a Special Presidential Task Force to direct, expedite and monitor development activities in the war-affected Northern and Eastern Provinces. The Government is to commence the construction of 25,000 out of 50,000 houses in the North and East in August. Construction of another 10,000 houses is to begin in January 2019. The road network project covers 1,847 kms. Over 20 livelihood projects would be implemented in the North and East. The Board of Investment (BOI) has said that 14 new projects would be implemented in the North. President Sirisena told the donors that 88% of land in the Northern Province held by the security forces has been released to their original owners and the rest would be released soon. Having received the Interim Report of the Office of the Missing Persons, a Cabinet sub-committee will be established to study the report. The President requested international donors to support programs for the welfare of the families of missing persons.